It was a relatively quiet week for our locals plying their trades in the world’s game, but one Delaware Valley man managed to make his mark in MLS. That man was none other than Philadelphia native and PSP (cough) favorite Jeff Larentowicz. Facing a D.C. United side in the midst of a historic run (and not the good kind), Larentowicz opened up Chicago’s account early in Saturday night‘s game. Thanks to some wonderful ball distribution from goalkeeper Sean Johnson, Chicago DP Juan Luis Anangono found himself deep up the right flank. Making a slaloming run through United’s traffic cones…er…defenders, the forward found Larentowicz just wide of the goalmouth. The Chicago captain then managed to slip the ball past the D.C. keeper from the tight angle to earn himself his second goal of the season. Chicago would go on to score another two before the final whistle. Chris Albright, D, Philadelphia Union — Did not play. Season: 2 games, 1 clean sheet. U.S. Open Cup: 0 games. Greg Cochrane, D, Los Angeles Galaxy — In the 18, but did not play. Season: 10 games, 7 starts, 2 clean sheets. U.S. Open Cup: 1 game, 1 start. Bobby Convey, M, Toronto FC — Started and played 67 minutes in Saturday’s 1-0 loss at Philadelphia. Season: 23 games, 21 starts, 1 goal, 4 assists. Ryan Finley, F, Columbus Crew — Played 14 minutes in Saturday’s 1-0 loss to Kansas City. Season: 13 games, 3 starts, 1 goal, 1 assist. U.S. Open Cup: 0 games. Dan Gargan, D, San Jose Earthquakes — No game this week. Season: 7 games, 5 starts, 1 assist, 1 clean sheet. U.S. Open Cup: 1 game, 1 start. Cristhian Hernandez, M, Philadelphia Union — Did not play. Season: 19 games, 14 starts, 4 goals, 4 assists. U.S. Open Cup: 1 game, 1 start. Antoine Hoppenot, F, Philadelphia Union — Played 33 minutes in Saturday’s 1-0 win over Toronto. Season: 27 games, 1 start, 3 goals, 1 assist. U.S. Open Cup: 1 game. Jeff Larentowicz, M, Chicago Fire — Started and played 90 minutes in Friday’s 3-0 win over D.C., scoring a goal in the 24th minute. Season: 30 games, 29 starts, 2 goals, 4 assists. U.S. Open Cup: 3 games, 1 start. Jimmy McLaughlin, M, Philadelphia Union — Did not play. Season: 23 games, 7 starts, 5 goals. U.S. Open Cup: 1 game, 1 start. 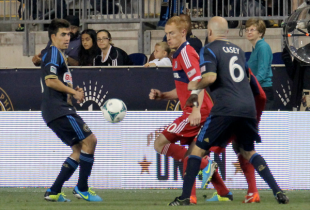 Jeff Parke, D, Philadelphia Union — Started and played 90 minutes in Saturday’s 1-0 win over Toronto. Season: 28 games, 28 starts, 9 clean sheets. U.S. Open Cup: 2 games, 2 starts. Marcus Tracy, F, San Jose Earthquakes — No game this week. Season: 5 games. U.S. Open Cup: 0 games. Andrew Wenger, F, Montreal Impact — Played 28 minutes in Friday’s 1-0 loss at Houston. Season: 18 games, 8 starts, 1 goal, 3 assists. Canadian Championship: 4 games, 4 starts, 1 goal. Greg Cochrane, D, Los Angeles Galaxy — Next game scheduled for October 24, 2013. Tournament: 1 game, 1 start, 1 clean sheet. Dan Gargan, D, San Jose Earthquakes — Next game scheduled for October 23, 2013. Tournament: 3 games, 3 starts, 1 clean sheet. Marcus Tracy, F, San Jose Earthquakes — Next game scheduled for October 23, 2013. Tournament: 0 games. Hunter Gorskie, D, New York Cosmos – Did not play. Season: 7 games, 7 starts, 3 clean sheets. Corey Hertzog, F, FC Edmonton — On loan from Vancouver, started and played 90 minutes in Sunday’s 2-1 win over Carolina. Season (Edmonton): 9 games, 9 starts, 2 goals. Season (Vancouver): 7 games, 6 starts, 1 goal, 1 assist. Canadian Championship (Vancouver): 2 games, 1 goal. Jeremy Vuolo, GK, San Antonio Scorpions — Started and played 90 minutes in Saturday’s 1-0 win over Atlanta. Season: 9 games, 8 starts, 10 goals against. U.S. Open Cup: 0 games. Eddie Gustafsson, GK, Red Bull Salzburg — Did not play. Season: 0 games. Jon Okafor, M, MYPA — Played 6 minutes in Sunday’s 1-1 draw with VPS. Season: 29 games, 15 starts, 2 goals, 1 assist. Alex DeJohn, D, Ekenäs IF — Started and played 90 minutes in Saturday’s 1-0 win over Klubi 04. Season: 24 games, 24 starts, 12 clean sheets. Russell Canouse, M, Hoffenheim — Started and played 90 minutes in Sunday’s 3-1 win over 1.FC Kaiserslautern. Season: 5 games, 5 starts. Zarek Valentin, D, FK Bodø/Glimt — Started and played 90 minutes in Monday’s 2-0 loss at Fredrikstad. Season: 22 games, 22 starts, 12 clean sheets. Cup: 3 games, 3 starts, 1 clean sheet. Billy Schuler, M, Hammarby IF — In the 18, but did not. Season: 11 games, 7 starts, 1 goal. Bobby Warshaw, M, Ängelholms FF — On loan from FC Dallas, did not play. Season (Ängelholms FF): 5 games, 5 starts, 3 goals. Cup (Ängelholms FF): 1 game. Season (Dallas): 8 games, 1 start. Anthony Allison, F, Umeå FC — In the 18, but did not play. Season: 17 games, 12 starts, 2 goals, 1 assist.